Schenectady, N.Y. - MILLION DOLLAR QUARTET is the Tony® Award winning Broadway musical, inspired by the electrifying true story of the famed recording session that brought together rock ‘n&apos; roll icons Elvis Presley, Johnny Cash, Jerry Lee Lewis and Carl Perkins for the first and only time. It was December 4, 1956, and these four young musicians were gathered together by Sam Phillips, the "Father of Rock &apos;n&apos; Roll" at Sun Records in Memphis for what would be one of the greatest jam sessions of all time. 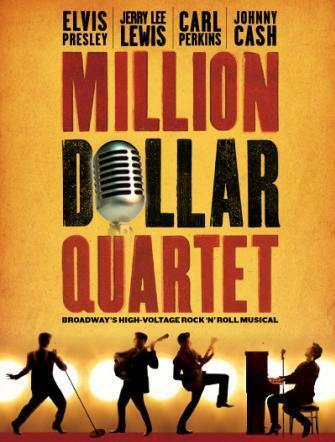 MILLION DOLLAR QUARTET at Proctors is sponsored by the outstanding Key Private Bank Broadway Series. Jankowski Insurance Agency and MVP Health Care are subsponsors for MILLION DOLLAR QUARTET at Proctors. ABOUT PROCTORS Proctors in Downtown Schenectady, NY, offers more than 1,700 events a year to close to 600,000 visitors and residents of New York State&apos;s Capital Region. As a charitable, cultural and educational non-profit organization, Proctors depends on membership, donations and grants to bring exciting shows and excellent educational and community events to the Capital Region. Income from ticket sales pays for only 67 percent of the cost of running Proctors.